Mercedes A Class Interior, Sat Nav, Dashboard | What Car? 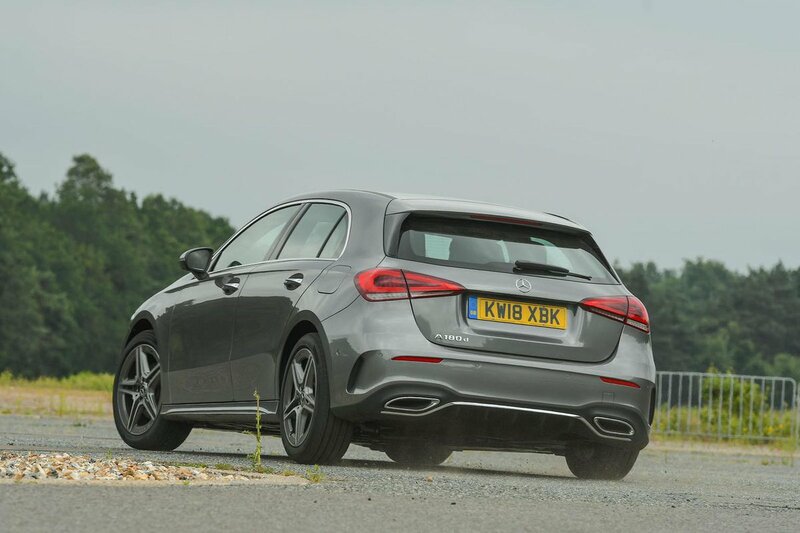 You’re unlikely to have much difficulty getting comfortable behind the wheel of the A Class. The driver’s seat adjusts manually on all trim levels (electric seats are available as part of the Premium Plus package), supports you in all the right places and there’s plenty of steering wheel movement. The sports seats in the range-topping AMG Line models are designed to hold you in place better through corners and also have integrated head restraints. They're supremely supportive to the extent that we didn't even miss the lack of standard lumbar adjustment, which you only get with the electric seat option. All versions of the A Class come with a 7.0in digital instrument cluster behind the steering wheel and a 7.0in infotainment screen in the centre of the dashboard, both of which sit behind one giant piece of glass. Opt for the Executive equipment package and the 7.0in infotainment screen is replaced by a 10.3in version. If you add the Premium package, the instrument screen is also enlarged to 10.3in, the two neighbouring screens combining to look like one giant widescreen that stretches across more than half of the width of the dashboard. 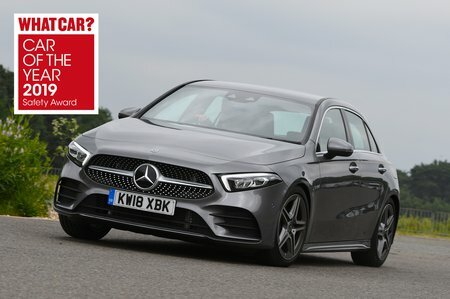 Owners of the third-generation A Class (that’s the previous model) might have been overheard cursing their cars' sizeable blindspots when pulling out of junctions or backing into tight spaces. They'll definitely approve of this latest car, whose visibility is some 30% better thanks to taller, squarer windows; helping to remove the guesswork from manoeuvring. What's more, all models come with a reversing camera as standard, but you’ll need to add the Executive pack if you want front and rear parking sensors. When it comes to infotainment technology, there’s nothing in the family car class that can touch the A Class. Even if you stick with the standard 7.0in system, you get sat-nav, a DAB radio and a couple of USB sockets. However, we'd be tempted to upgrade to the optional 10.3in touchscreen that comes as part of the Executive Pack. Both systems can be controlled through the touchscreen itself, by swiping and pressing a main touchpad between the front seats, or by another tiny touch pad on the steering wheel. The touchpad methods are the easiest to use when you’re driving; you don’t need to continually study the display as the main pad provides haptic feedback to help you navigate through the menus. That said, the rotary dial interfaces in the Audi A3 and BMW 1 Series are still that bit more intuitive. Another option is something Mercedes calls ‘augmented reality navigation’. It is, in effect, a live camera feed of the road ahead but overlaid with house numbers, road names, direction arrows and other useful bits of information to help you work out where you need to get to. Even the cheapest models come with a Siri-style personal assistant as standard. To wake it up, you say "Hey Mercedes" and then, in theory, use normal speech to control various aspects of the car, from sat-nav to interior temperature. It’s definitely fun to use and is sometimes very useful. But, like many voice-recognition tools, it can occasionally misunderstand what you’re saying or simply not recognise it at all, leaving you wondering why you even bothered trying. If there’s one thing about the A Class for which we'd give a straight A without a second thought, it’s the look of its interior. It’s more in line with what you’d expect to find in a luxury saloon than a family hatchback, with lashings of shiny piano black plastic, leather, wood and metal in all the important places. The jet-style air vents, borrowed from the E-Class Coupé, also help to lift the overall impression above most other premium-badged rivals, especially when they glow like afterburners at night. Visually, the interior eclipses the 1 Series and Lexus CT, and even tops the Audi A3 for pizzazz. However, where the A Class falls down and the A3 doesn't is in sheer build quality; few cars feel more solidly constructed inside than the A3 and there are a few wobbly bits, such as the climate control panel, that disappoint slightly in the A Class.